Welcome to the National Centre for Biological Sciences (NCBS-TIFR) Biomolecular NMR Facility. 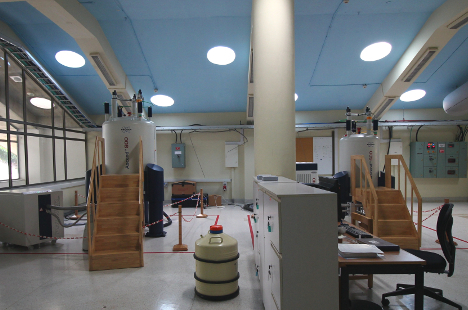 The NMR Facility is dedicated to providing state-of-the-art NMR technology as well as exceptional NMR experties. The Facility, administered by the Dr Ranabir Das. At present NMR Facility has both 800 and 600 MHz Bruker AscendTM spectrometer avalable, which provide exceptional performance in liquid state applications. Instrument capabilities can be found here. NMR time and serveses are scheduled via an online request form. A general description of sample requirements for NMR analysis can be found here. For more information on facility usage and services, please contact the Facility Manager. Together with X-ray crystallography, NMR spectroscopy is one of the two leading technologies for the structural determination of biomacromolecules at atomic resolution. In addition, NMR provides unique and important molecular motional and interaction profiles that contain pivotal information on the functions of biomacromolecules. The information is not only important for the understanding of life processes at the molecular level but also for drug development.